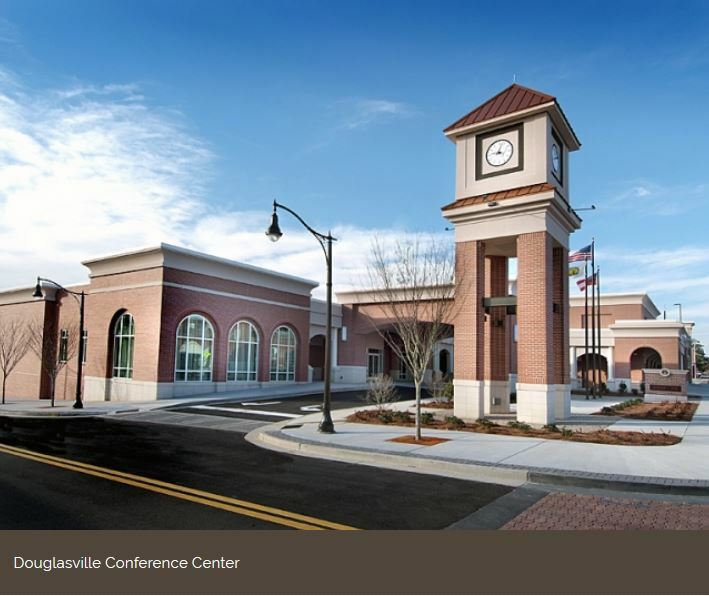 Douglasville's new Conference Center includes a 7,672-square-foot ballroom that can be divided into five separate rooms, and offers exceptional bride and groom dressing rooms, and a breathtaking rear terrace that overlooks Douglasville's charming historic district. The Conference Center also offers a business center, two pre-function areas, a 150-seat auditorium and three meeting rooms. The unique blend of elegance and technology-savvy equipped rooms makes the new Douglasville Conference Center the perfect choice for weddings, social, and corporate events. Whether planning an intimate or large-scale affair, the conference center can accommodate groups from 15 to 600 guests. As an added benefit, the Conference Center offers free parking and is easily accessible to an adjoining 300-space parking deck.